Home > Shop By Brand > Griot's Garage Car Care for the Perfectionist > Griot's Garage Black Shine High Gloss Tire Spray 128 oz. You get to be the boss of your gloss! Griot's Garage Black Shine High Gloss Tire Spray is a spray and wipe tire dressing that creates a darker, more uniform color on your tires, while leaving behind a durable layer of protection that guards against rain, road grime, car washes, and damaging UV rays. Griot's Garage Black Shine High Gloss Tire Spray lets you decide on either an insanely high-gloss shine, or a subtle satin glow - which will you choose? Changing your mind regularly is a mark of the human condition. What if one day you want tires that shine that a freshly polished chrome pipe, and other days you'd rather a low, subtle sheen? You'll need a product that can do both, of course! Griot's Garage Black Shine High Gloss Tire Sprays puts the decision in your hands and lets you choose your desired finish. Griot's Garage Black Shine High Gloss Tire Spray can add either an intense shine or a subtle sheen to your tires, it's up to you! Griot's Garage Black Shine High Gloss Tire Spray provides your desired level (or lack thereof) of gloss, but also protects your rubber from the damaging elements they are exposed to every day. Dirt, road grime, mud, snow, rain, UVA rays, car washes, even driving down the road causes tiny amounts of damage to your tires. If they're not protected, they can become discolored, faded, and tired-looking. 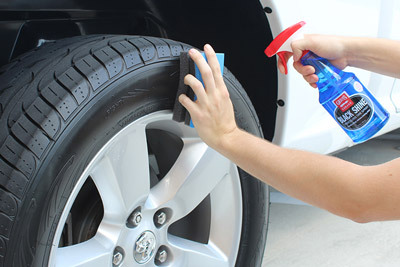 Griot's Garage Black Shine High Gloss Tire Spray will keep your tires protected AND dressed! Here's how Griot's Garage Black Shine High Gloss Tire Spray works: For an intense, high-gloss shine Spray Griot's Garage Black Shine High Gloss Tire Spray directly to your tires…and wait. The longer it sits, the glossier it gets! Then, using a tire applicator pad, spread Griot's Garage Black Shine HIgh Gloss Tire Spray evenly around the tire and allow to dry. For a sleek and subtle finish, spray Griot's Garage Black Shine High Gloss Tire Spray onto a tire applicator pad and wipe on the tire until you attain the desired effect. For a lower gloss, buff excess product away with a clean microfiber towel. It's that easy! Give your tires the EXACT look you want with Griot's Garage Black Shine High Gloss Tire Spray! Product easy to apply, Glossy Shine. Purchased gallon size after trying spray bottle size.